To my tenured, and tenure-track colleagues in the STEM subjects in Canada, and also to administrators in organizational units that control budgets providing funding for STEM speakers, and conferences. I'm a Full Professor in a Faculty of Science (previously Faculty of Science & Engineering, and before that, Faculty of Pure & Applied Science). I've been an activist for women in STEM since 1985, when I was graduate student at Oxford Zoology. Most recently, I organized a celebration of York University's female science alumni. This letter is a call to action for everyone to adopt explicit policies aimed at achieving gender balance in speaker line-ups across Canadian post-secondary STEM research and education. Such policies are broadly lacking at pretty much all organizational levels: from the individual, to the department, the faculty, the higher education institution, and our oversight bodies. My recent attempts to get action on the continuing issue of all-male and mostly male conference speaker line-ups in my own fields, hit a wall. There is an increasingly networked international community committed to awareness-raising on this issue. Professor Jonathan Eisen at UC Davis writes open letters all the time! A number of solid policies and procedures on how to address the lack of female speakers in conference plenary line-ups and and prestigious invited lectures have been published and are open access. The reasons for the continuing presence of all male and mostly male speaker line-ups are related to unconscious gender bias and gender stereotype threat. The amount and quality of research in peer-reviewed journals on these topics continues to increase. This research is broadly discussed in diverse areas across the STEM fields. Therefore, in my opinion, it's no longer acceptable for many of my STEM colleagues to keep on claiming ignorance about the complex reasons for the ongoing under-representation of women in STEM. 1. How do I know that no one heard me when I talked to them nicely? 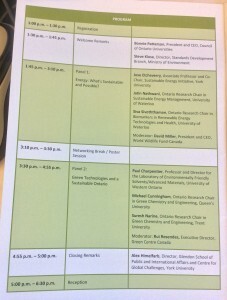 In Fall 2013 I was dismayed to discover that a mini-conference on sustainability, with panels on energy and chemistry (green technologies), sponsored by the Council of Ontario Universities, and held at Glendon College, York University, was comprised of two all-male panels of 4 speakers each: 8 men. I was director of the university's research institute in sustainability at the time (although, I had nothing to do with organizing this event), so, naturally, I raised my concerns about this speaker line-up, ahead of time, with a Glendon colleague. I was told that the key organizers of the speaker line-up were the 4 Ontario Research Chairs who spoke at the event. Given this, I resolved to speak with all of the speakers after their panels, to ask them what they thought of the 100% male line-up, how and why this had come to be, and what they thought should have been done to achieve gender balance, both at this event, and in the future. A couple of the speakers told me: "I did notice, but I wasn't one of organizers, so I just showed up". 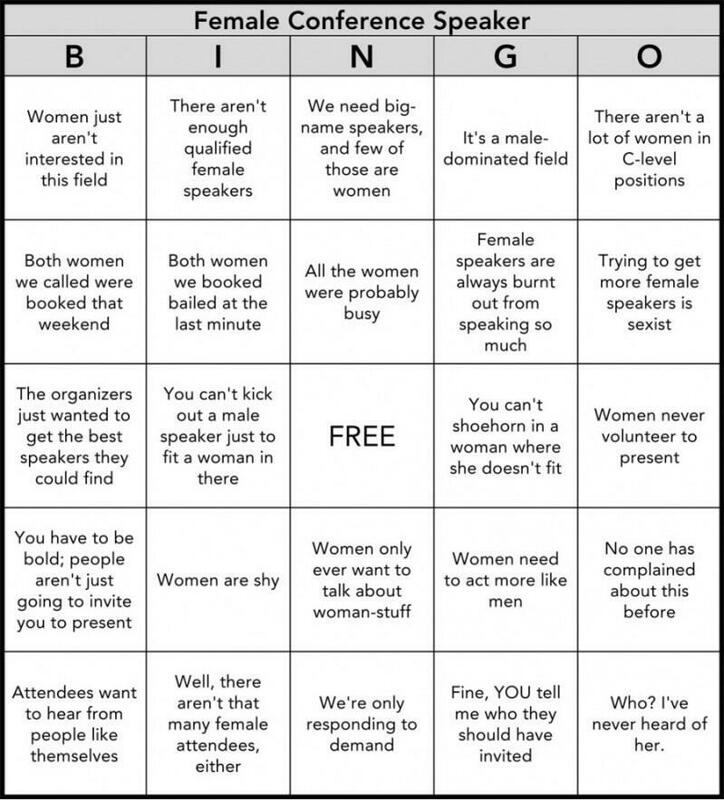 I got the usual excuses as per the brilliant Female Conference Speaker Bingo Card from the organizing committee members. David Miller, a panel moderator, whose daughter, like mine, is in Engineering, agreed that the two panel moderators could, at the very least, have been female. I followed up with emails to the panellists, deans of their faculties, and others including the Council of Ontario Universities, providing information and research pertaining to the ongoing challenges faced by women in STEM, including that of unconscious bias. 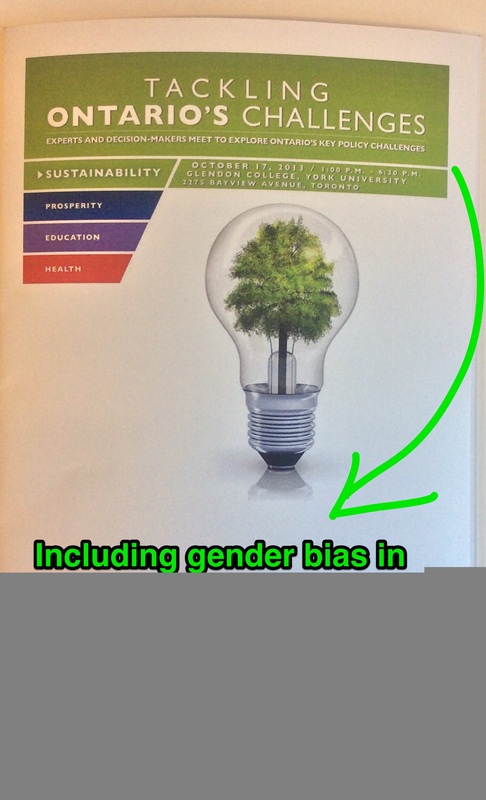 Not many people responded to my email, although President Emerita Lorna Marsden emailed me, expressing her shock that a 100% male line-up of speakers, on the topic of sustainability, had happened at York University. After all, Sustainability as a research field, includes notions of environment, economy & ethics. The Council of Ontario Universities bureaucrat whom I included in my group email responded with: "it's not our responsibility, but that of the research chairs, and is the organizing committee's job." In other words, achieving gender balance in the speaker line up at an event aiming to showcase some of Ontario's finest research, paid for by the taxpayers, appeared to be nobody's responsibility. The research chairs that I spoke with did not prioritize this, and one of them told me that they had asked one woman, and she couldn't make it. In their view this was doing enough. I had to accept this, but I wanted to broaden the conversation, and I tried my best to do so, via private conversations, and group emails. 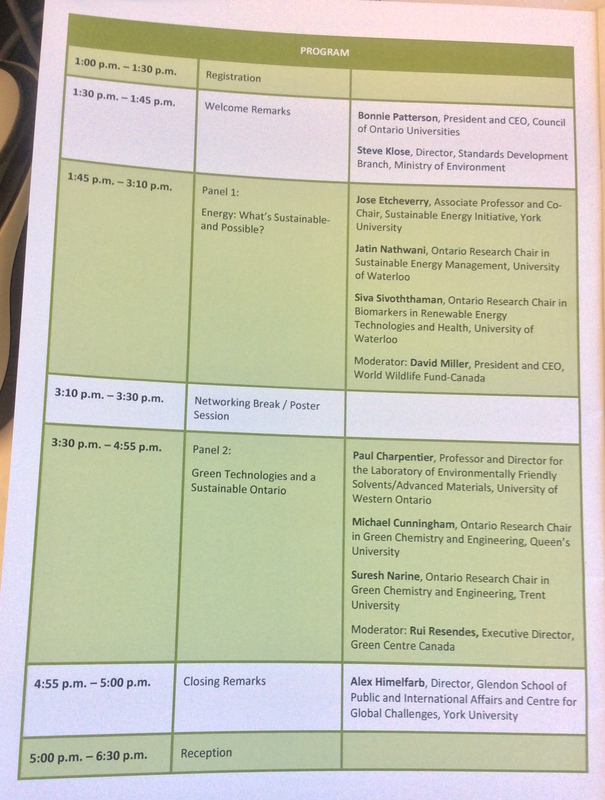 I got proof that none of my efforts were effective, when, fast forward to spring of 2015, I observed a nearly identical all-male sustainability panel appearing at April's Ontario Research showcase at the Toronto Metro Convention Centre. Most of the panels were male dominated, and out of 33 speakers across 6 panels, a total of 11 were women. So, two members of the group involved in the Fall 2013 all-male event, replicated a similar all-male event 18 months later, after I had spoken with them about the problems with the gender balance of their prestigious event, and how and why to seek gender balance. I tweeted my surprise at the make-up of this sustainability panel. I also followed up, again, with the Dean of Engineering at Waterloo, who had not responded to my 2013 emails, and I began a good dialogue with an associate dean who spearheads action in support of women in engineering. The Council of Ontario Universities staff advised me that they would happy to discuss it, but after a brief email exchange, in which I sought an informed, comprehensive conversation, this has yet to happen. I hope that if COU staff read this letter, that they will have a conversation about how they can lead on simple policy that will effect change in the ongoing all-male STEM speaker line ups being held under their brand. A large STEM Social Media community has great fun documenting examples of mostly male speaker meetings using the hashtag, #YAMMM (Yet Another Mostly Male Meeting). Some scholarly organizations such as the American Astronomical Society track their speaker line-ups and has policy on including women. CBC radio recently covered the story of Saara Samar's Tumbler: Congrats you have an all male panel! The pattern has been noticed and people are talking about it. 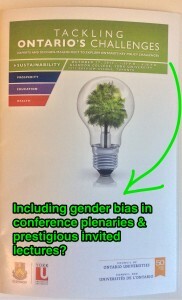 I'm disappointed to say, that in Canada, there are still many conferences with all or mostly male plenary or invited speaker line-ups popping up regularly, including in my fields of research (sustainability and ecology). So, what should the Canadian STEM community do? Professor Jenny Martin published 10 simple rules for achieving conference gender balance in PLOS Computational Biology (20-11-2014). Why doesn't every STEM department and faculty adopt such a policy? Why doesn't every university adopt such a policy? Why don't NSERC and COU (which both create and support STEM research chairs) adopt and support such a policy? At the individual level, when one of my STEM colleagues is invited to be a plenary speaker or give a prestigious lecture, make it a habit to ask the organizers what the organizing committee's policy is, and how they addressed the issue of speaker balance. Keep the bingo card handy! If the organizers don't have such a policy, then point them to Jenny Martin's article. It's quite frustrating to continually encounter ignorance about this particular issue amongst members of Canada's STEM community, though this is, in my opinion, a low-hanging fruit, that is simple to address. Furthermore, it will have multiple cascading benefits. Please read my and others' blogs and social media on the topic. There are many scientists and engineers talking and writing about gender stereotyping, and broader, much more challenging issues, including sexual harassment of women in STEM. If you're a male STEM researcher, who doubts what I'm writing about, simply go to Professor Jonathan Eisen's Tree of Life Blog Posts on the topic of speaker line-ups and women in STEM. Adopting policies on gender balance in plenary speaker line-ups and for prestigious lectures is, perhaps, one of the simplest first steps for many of our colleagues to take, that will push against some of the barriers that women in STEM encounter, and will shift the norms in the right direction. I've organized many seminar series and conferences in the last 35 years. When I was younger, I was usually the lone woman on the committee and the only voice raising the issue of the lack of female speakers. 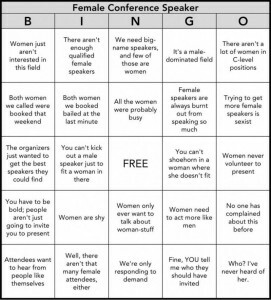 My concerns were mostly dismissed, leading to all-male speaker line-ups (email me if you want lists of the events). It's tough to be that one person advocating for inclusion and diversity in speaker line-ups, but the pressure can be alleviated by having policies in place: I have seen it in action. Twenty-five years ago, I would look at my colleague, Professor Emerita Judy Myers' group photos from Gordon Research Conferences: all white, mostly male. I didn't think I would ever want to go to one. BUT, the foundation that runs the Gordon Conferences made a conscious decision to diversify their meetings with respect to gender, people of colour and age. The faces at the vibrant Gordon Conferences that I attend have changed radically compared with Judy's photos from the 1980s and early 90s. And, it wasn't random.